Before coming into our showroom you may want to measure your windows so we can give you a free close cost estimate. Measuring for new windows is one of the most important steps in the window-replacement process and when done right, our installation experts will be happy campers on installation day. We typically re-measure before the final order is submitted to manufacturing, because we demand perfection and know you expect that our product will be installed correctly. Step 1: Begin by measuring the inside width of the old window frame, jamb-to-jamb, in 3 places: across the top, the middle, and along the bottom. Write down the smallest of the three measurements. Step 2: Measure the window height from the top of the inside frame to the bottom of the frame in 3 places: at the left jamb, in the middle, and at the right. Again, write down the smallest of the three measurements. Step 3: Check the squareness of the window frame by measuring diagonally from corner to corner (i.e. top right to bottom left corners then visa versa). 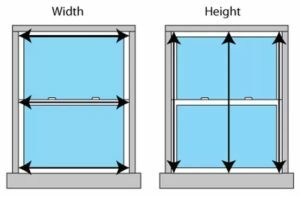 The two measurements should be the same, but we all know that there is a possibility that the previous window installers could have been in a hurry or possibly nearsighted, so if the frame is out of square by 1/4 inch or so, don’t worry; the replacement window can be shimmed to fit. Anything more than a 1/4 inch off please take note and let us know, it might require an adjustment to the frame before installation or you might need a full frame replacement. If you have any questions, just call us before you start measuring and we will walk you through it.